How we choose to describe the texture and feel of rugs and carpets speaks volumes to what we most cherish and on first glance it would appear as though anything describable as smooth ranks highly amongst those things. Smooth as glass. Smooth as a baby’s bottom. Smooth as silk. Smooth as velvet, though rarely is the type of velvet mentioned. Each describes something as smooth – that is to say as relatively even and not rough, yet each of these various similes conveys important and subtle differences. Smooth as glass is certainly a desirable characteristic when describing a paint finish, but to describe a carpet, likely not. Carpets should be smooth like velvet! Yes, velvety smooth. Preferably linen velvet. That kind of velvet smoothness, or is it ‘chippy and brittle’? But what about other descriptions? ‘It’s like butta!‘, shaggy, wispy, cloud like, durable, pliable, to name but a few. All of which describe what is known as the hand of the carpet and they invite the casual observer to ‘Come on now touch me!’ – quoting the Doors to convey the degree of sensuality carpets with exceptional hand possess. 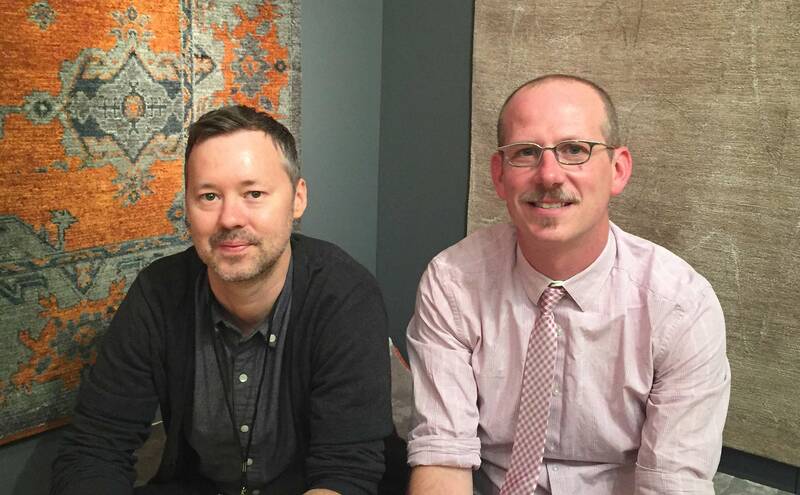 Nathan Tucker – Showroom Manager of AtelierLapchi Chicago, and Michael Christie – The Ruggist, Editor of Rug Insider shown at Lapchi during NYICS 2015. 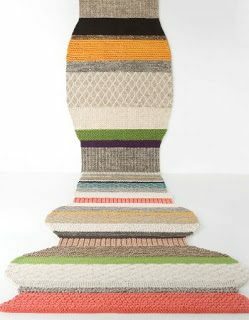 | Image courtesy of Rug Insider. During the 2015 NYICS I had the pleasure of spending some time with Nathan Tucker, Showroom Director of AtelierLapchi Chicago. We discussed Lapchi‘s new carpets of course, life, the dangers of the quickly approaching mid-life, and the feel, that is the hand, of carpets. After the show the discussion continued in a series of emails in which we talked at length about what makes for great hand in a carpet. Enjoy! Hand has been variously describe as ‘The quality of a fabric assessed by the reaction obtained from the sense of touch.’ or ‘A person’s estimation when feeling fabrics between fingers and thumb.’ or ‘The sum total of the sensations expressed when a textile fabric is handled by touching, flexing of the fingers, smoothing and so on.’ – Quantification and Evaluation of Human Tactile Sense Towards Fabrics from Nu Cybertech. Makers of the Phabrometer® System for quantified measurements of hand in fabric. The Ruggist (MC): I was once engaged in a lively conversation with a gentlemen who insistently defended his (in my opinion) incorrect viewpoint on a regional rug market. To assert himself he said ‘Well I’ve been doing this for fourteen years’ to which he was rebutted with ‘That’s nice, I’ve been doing it for (what was then) seventeen years.’ Since this is the rug industry I am thusly required by people not unlike myself to verify that you are indeed qualified to speak on the subject at hand – pun intended. What is your background and how is it that you came to be schlepping rugs? Nathan Tucker (NT): Bike messengering, of course! In the fall of 1998 a good friend and I were working as bicycle couriers, and looking towards not doing it for another tough Chicago winter. He found a job at a repro-graphic print house, and one of his new colleagues had a friend working in the Merchandise Mart who was looking for someone to do some sales assistance and showroom merchandising. MC: And so you got a job there. Brilliant! What did you sell? 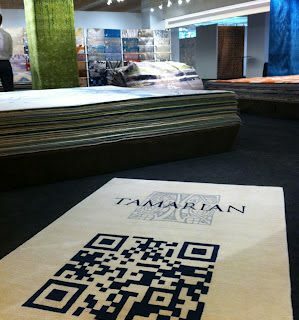 NT: The company was a mutli-line flooring wholesaler, focused mostly on high-end broadloom. There were a handful of manufacturers we worked with doing hand-made stuff — a very young Tamarian, Ararat (James Opie), JSL, Carlton, Rugs by Robinson, and a few one-of-a-kind lines with kilims, khotans, and moroccans. It was those sorts of lines and some other custom tufted products however, that I liked working with and [which] gave me the patience to stick it out and find a more interesting path in the rug world. While I wouldn’t trade in the experience – learning flooring from a broadloom perspective is in my mind a great foundation – I much prefer working with the prettier stuff! MC: Do you remember the first carpet you touched? What was it like? NT: The first fine carpets that I can remember are two semi-antiques, still owned by an uncle. One was an Isfahan, and the other a Tekke, details I didn’t know or care of at the approximate age of eight (8). Regarding the Isfahan, I remember thinking he needed a new rug. Haha! The Tekke, I suppose, left an impression on me, though. That rug’s pile is super dense and supple, and the colours so rich and saturated in pigment. I don’t know a lot about Turkmen pieces, but this one has a super plush thickness to it, and still holds court in my personal rug pantheon! MC: I was prompted to write about the feel, the hand of carpets because of something you said when you were showing me the new ‘Plush’ texture from Lapchi. I’ve always said ‘This has a great hand…’ whereas I noticed you said ‘This has a great handle…’. Would you care to elaborate as to why you say handle versus hand. Is there a distinction in your mind between the two, or is it solely semantics? NT: I heard both variations early on, and use both terms. Not until now did I consider this, but in some ways it would make sense that ‘hand’ is more appropriate when describing the sensation of sweeping across the pile of a carpet, as opposed to picking up a corner and really feeling its pliability and weight. The fastidious notion of ‘hand’ as the sensation felt while sweeping across the face of the carpet. | Image by The Ruggist. MC: While I love the notion of a distinction between the two (2), I think that might just be an attempt to split hairs, as in actuality both the surface feel and and the body feel of a carpet are part and parcel to the overall hand, handle perhaps if we’re being pretentious, pedantic, or otherwise. I’m not sure though, but the idea has a certain appeal. So if we were going to be somewhat pedantic and say that hand is the way a carpet feels as you rub it versus handle as the way a carpet feels when held, I guess I’m more inclined to really be moved by the handle of a carpet. Take for instance the blanket like feel of something like The Stephanie Odegard Collection‘s Abu Quality, or similarly cc-tapis‘ ‘Oldie’ Series. I love the more blanket like textures that accompany a slightly less dense weave. What are your thoughts? The fastidious notion of ‘handle’ as the pliability and weight felt while grasping the body of the carpet. | Image by The Ruggist. NT: I think that the new oushak-esque knot-type we’re trying with Texere has a little of the appeal you’re speaking of. I’m a big fan of Kooches‘ Pamir and Yardo qualities. A few of the other things Tom [DeMarco] does have a wonderful feel to them as well. The yarn is super soft and it’s lovely to even hold a sample in your hands. It somehow feels even more old-world, maybe. I’ve also felt some super low, flat and loose cashmere qualities which I’ve really admired. When you – as a salesperson – hand over a sample to a designer who has presumably ‘seen it all’, and you get that surprised lift in the eyebrow that says ‘Ooooh, this is nice!’; it really helps push a sale along without question. MC: Specifically as it pertains to Lapchi’s new construction. Describe the hand. What was the goal when creating it? NT: I’d come across this Indian-made all Mongolian cashmere sample which was part of the inspiration. It was very, very, heavy, and silky beyond belief. It was also the sort of thing though, if we were to produce something like it, using that yarn type, the retail price would have been north of $190/sqft (USD). Compared to some other lines out there that isn’t impossible to sell, but we wanted to make something more attainable. This new plush pile we’re making has some great heft to it, but it’s still very refined and clean. Flokati and other shaggier piles, Moroccans included, are OK, but they’re a little course, and have a lot of lift off tackiness due to that high lanolin content. I wouldn’t want to roll around on it for instance. I’ve not used anything more than a single ply of silk in the field yet for this new Lapchi quality, which would of course make it more luxurious, but I don’t think it’s necessary. As it is made, there’s a lovely amount of opulence due to how the end of the silk yarn splays out. 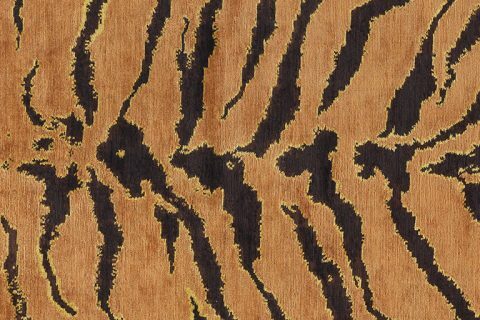 The main goal was to offer a new texture, one which could also be used nicely for our back catalog of designs as well. That, and something you can roll around on! MC: Two (2) questions! You said ‘I’ve not used…’ Was this collection your work? and ‘Could you put a dollar figure on ‘more attainable’? NT: To say it was my work would be to grossly overstate things. At best I was the coordinator of the collection as I was sort of at the helm of coordinating everything this year. We had several sources for designs, the five (5) audio wavelength inspired ones being my work, and I coloured most of it. The plush idea was actually brought to us by this new designer, and we [at Lapchi] worked collaboratively in executing it. As for pricing, the ‘Plush’ starts around $114/sqft (USD) retail for a sixty/forty (60%/40%) wool and silk blend pile. MC: How about a great fabric, material, pelt, et cetera that you think has exceptional hand. Is it desirable to try and mimic that with a carpet? NT: There’s nothing quite like mohair pelts and pashmina throws which can seemingly take the temperature of your hand down five degrees (5º), or warm your body up twenty degrees (20º), depending on the application. Having said that, I’m a little on the fence there, I guess. Hair-on hides and pelts do induce a level of guilt I’d come to terms with years ago, and I probably wouldn’t personally buy it, and endeavour not to sell it, but I’m all for mimicry. There was a Japanese product imported by Soho Carpets (now defunct) which was allegedly the same material used to make Barbie hair. It came in six foot (6′) widths, so you’d have to seam together bigger rugs. It was unbelievably soft, and we joked how cool it would be to put together a twenty foot (20′) runner to use as a Slip’N Slide [type] feature for a satin pajama party. MC: Please be sure I get an invitation if you can manage to locate some for a party. As you know I fancy myself a student of rugs. What are your thoughts on the various methods of rug construction as that relates to their hand? NT: I think in regards to Tibetan styles of rug making – despite it being around for as long as has – we’re still in the midst of a lot of innovation. Over the last fifteen (15) year there have been a lot of new approaches. Many of which are probably there to accommodate the higher complexity needed for today’s design demands. For instance, Zoë Luyendijk is doing a cut-pile in either 100 or 150 knot, all uniform rod sizes, but there’s a very unique texture to the more stippled areas of her work. That alone can account for not only a visual and underfoot difference, but also a completely different feel when you handle it. As far as cut pile goes, our Texere production in Pakistan certainly has a different feel all together. Ghazni wool certainly accounts for some of it. That yarn has a LOT [emphasis Nathan’s] denser characteristic, which doesn’t accept dye as evenly. Once sheared, you can see into the core of those plies and see how they didn’t take on as much colour. The handle is much more rigid, and substantial underfoot as well. Some of our new collection featured a different knot-type, almost as thin as a soumak, but much more pliable. I’m super excited to do some more work with this texture. A great mix of new and old. MC: What materials do you feel give the best hand? NT: Generally speaking: Wools (particularly cashmere and merino) and silks. But I will give a nod to a really well produced solid bamboo; It has a nice density and hand, even if it’s not something that will stand the test of time. I recently felt a solid white linen that was fluffy and soft, beyond belief, whereas normally it’s a bit chippy and brittle feeling, contrary to how it looks like it would feel. 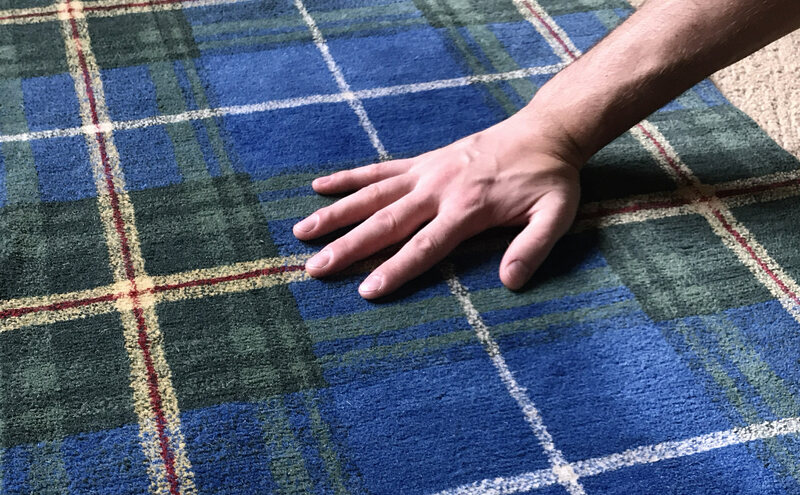 The Ruggist Concludes: Whether you choose to say ‘hand’ or ‘handle’ the overall physical feel of a carpet is a defining characteristic critical to its success or failure. Though the rug industry does not utilize a regimented system to gauge and quantify hand, we should be cognizant that the type of hand required varies from application to application. 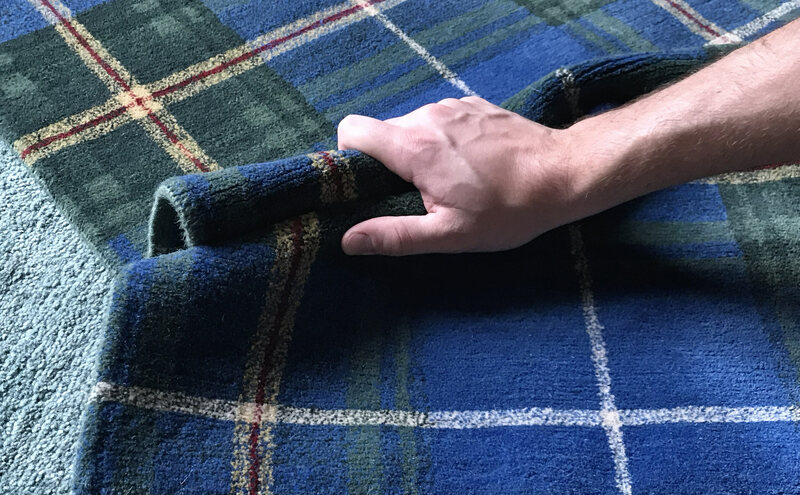 Just as the flowing hand of a drapery fabric or the stiffer hand of a classic coach cloth are specific to their uses, so too does the same apply to rugs and carpets. While the desirability of a sensual, lush, soft, and enveloping blanket like hand is hard to overlook, sometimes we just need a carpet that is dense and stiff. Previous Post:No Euphemisms, It’s a Knockoff!